In the 1902 update to Configuration Manager current branch, Microsoft continues to boost Cloud Value, Customer Voice, Get Current, and Simplification. Like other Current Branch updates, it will be automatically downloaded and SCCM will notify via the Updates and Servicing node in the console. This update can be applied on site servers that run version 1710, 1802, 1806, or 1810. When installing a new site, it’s also available as a baseline version. To learn more about baseline versions and upgrade versions, see our blog here. Want the update now without waiting for the rollout? Get the Powershell script. Get Current with Office is one of the key capabilities in the 1902 update and optional integration with the Readiness Toolkit for Office provides insights to prepare enterprises for Office 365 ProPlus deployments. These insights now complement the end-to-end ability to deploy Office 365 ProPlus, from readiness, to deployment, to monitoring. Learn more about Readiness toolkit. Additionally, in update 1902 are enhancements to Phased Deployments which now has its own dedicated monitoring node. From the lifecycle dashboard, organizations can now view the support lifecycle for the versions of Office in their environment. Additionally, SCCM 1902 has added the ability to configure known folder mapping to OneDrive, providing a modernized way to effortlessly move or redirect users’ known folders and data to OneDrive. Other significant areas of improvements in the other themes of the release include user comments in email notifications for approval requests from Software Center, improvements in client health with a dashboard and detailed breakdowns of client health status across your organization, and Windows software update improvements to better control the end user experience with software update downloads and installs. There are new Management Insight rules for optimizing and simplifying collections and packages. CMPivot from the CAS can be used to edit and copy existing PowerShell scripts used with RunScripts. Unhealthy Configuration Manager clients adversely affect overall compliance. 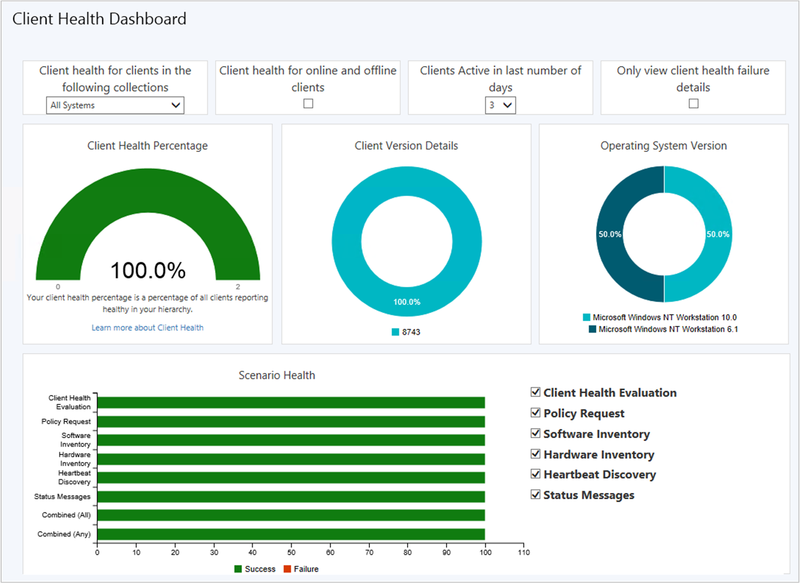 A new dashboard with information about the health of Configuration Manager clients in the environment shows client health, scenario health, and common errors. To find: In the SCCM console, go to the Monitoring workspace. 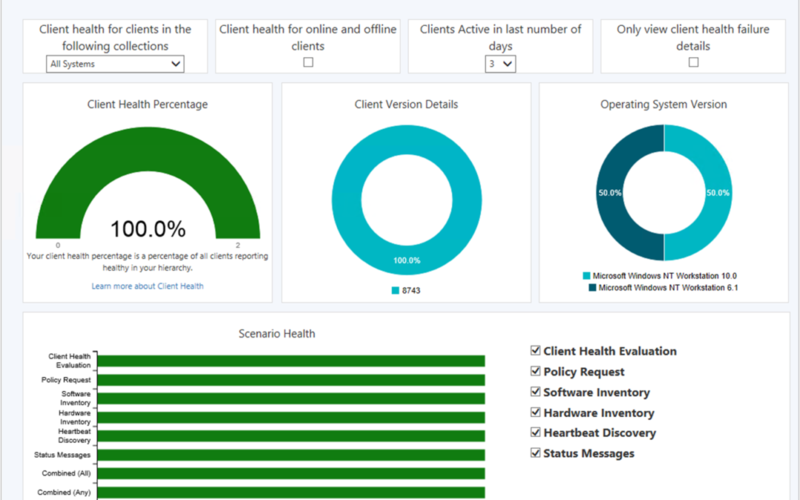 Expand Client status and select the Client health dashboard node. More cmdlet information and examples.